It’s a new year, so that means most of you are trying to stick to your new years resolutions. Last year, I made a resolution to eat more fruits and veggies, but let me tell you it wasn’t easy for me. So, I started to make myself a smoothie every morning that was loaded with fruits and veggies. And the best part, the smoothies tasted WAY better then eating a bowl of broccoli. This Berry Green Smoothie is my new favorite. I know this smoothie doesn’t look the prettiest, but all that matters is that it’s loaded with healthy fruits and veggies and even more important that it taste delicious…right!? I love loading this smoothie up with spinach, frozen bananas, strawberries, peaches, blueberries, and avocado. I also like to add vanilla almond milk and a drizzle of raw agave to add a touch of sweetness. 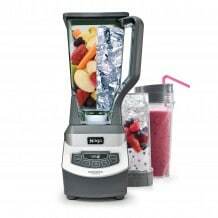 Blend it all together and you have yourself a delicious, refreshing smoothie to start you day off right. ✓ USE FROZEN FRUIT: I like to use frozen fruit instead of ice cubes in my smoothies. For this smoothie you want to use mixed fruit, like strawberries, blueberries, bananas, peaches….these berries give you energy! And to make it super easy, I just buy the chopped frozen mixed fruit in the frozen section of my grocery store, because I’m all about making things quicker and easier! ✓ FILL UP YOUR BLENDER: You always want to layer your ingredients softest to hardest (frozen). First, add the vanilla almond milk, greens, raw agave, avocado and spinach. Then, add the frozen fruit. ★ Make sure to read my SMOOTHIE TIPS above before you start baking! *I used vanilla almond milk but you can also use soy milk, cow's milk, coconut water or plain water. *Store leftover smoothie covered in the refrigerator for up to 2 days. I totally need to do that this year! I meant to eat waaay more veggies than I actually did… And as much as I love broccoli and spinach, I like sipping on smoothies way more. 😉 Pinned! I think your smoothie is really pretty! I love the little multi color seeds! Hi Jenn! This smoothie looks incredible! Such a pretty color with the purple specks throughout. I love your idea of sticking to fruits and veggies by making smoothies. Such a great idea for the new year! Pinned! I love how light and healthy this smoothie looks and the color is just gorgeous! Just the kinda detox I need right about now. 😉 Pinned! 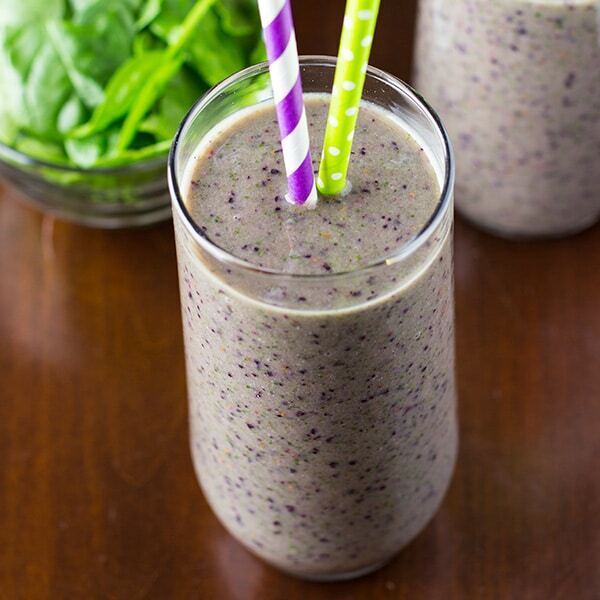 I love all of the colors in this smoothie! I think it’s pretty with all of those colorful flecks. 🙂 Smoothies are one of my favorite ways to eat lots of fruits and veggies! I love smoothies, but I have been hesitant to try a green one. Yours doesn’t look that green, though, with all of that wonderful fruit. I may have to “man up” and try one! I love the ingredients in this smoothie and I definitely need to start with some healthy drinks and give up the pop! 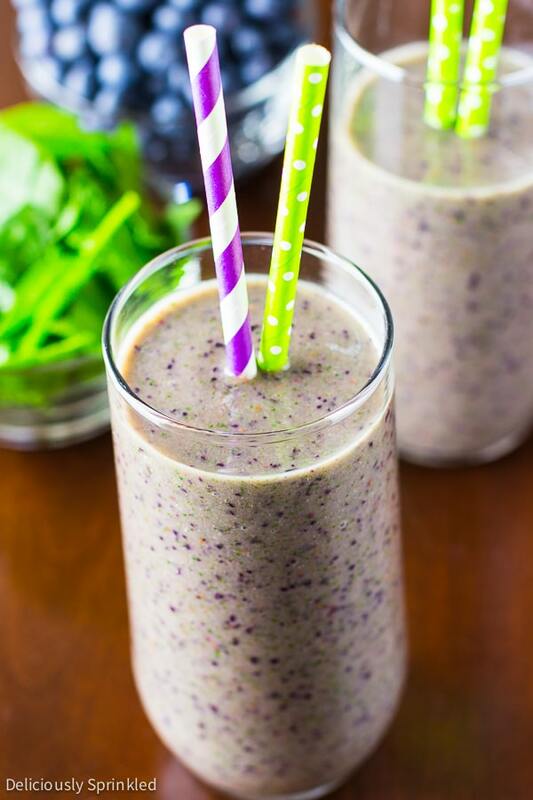 Love the flecks of green and purple in this fun smoothie. So refreshing and good for you. Great way to start my day. I could totally drink this for breakfast every morning! I can get my son to drink a green smoothie, but getting him to eat a bowl full of broccoli will never happen! Oh wow this looks great! Exactly what I need right now after Christmas! WOW! This looks really beautiful and delicious! I have never been a smoothie fan, but you may have changed that! 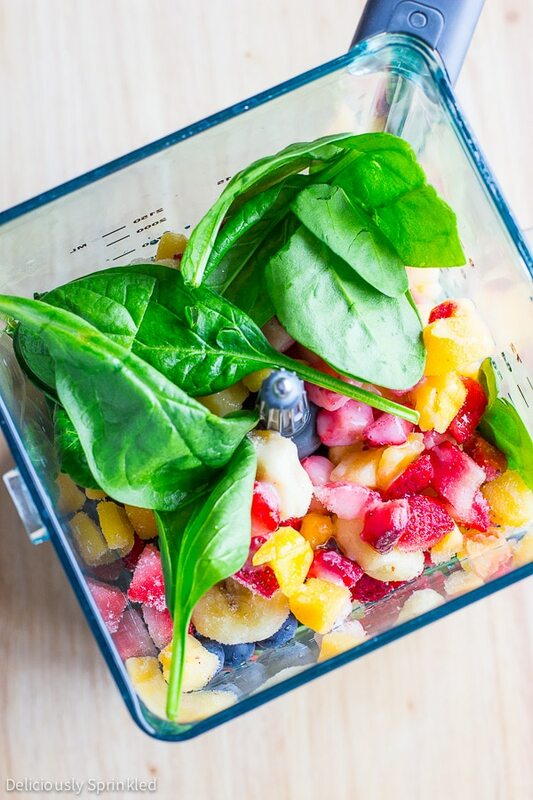 Now that is a good-looking smoothie. Whether or not there’s lots of colors, I can tell there’s plenty of vitamins and minerals packed in one glass. Looks so good and I love the photos! This smoothie looks fantastic! I really need to incorporate healthier options into my diet. I think I’ll start with this smoothie!